Many people might not know that you can treat a hamstring injury with Active Release Technique (A.R.T.). Fortunately the doctors at 5280 Cryo & Recovery Clinics can—the truth is that there are not many sports injuries we can’t treat. 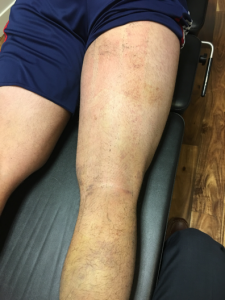 In this article, we will outline a case study of a real patient treated in one of our clinics for a hamstring injury. Fig. 1. Image of the patient’s right hamstring upon presentation for initial examination and treatment, 3 days post-injury. 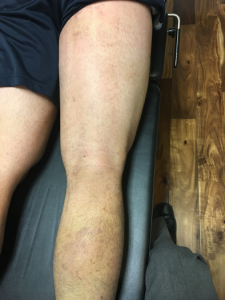 The patient is a 38-year-old male who presented to our clinic in the fall of 2016 for assessment and treatment of a right hamstring injury. He came to the office three days after the initial injury, which occurred while the patient was water skiing. 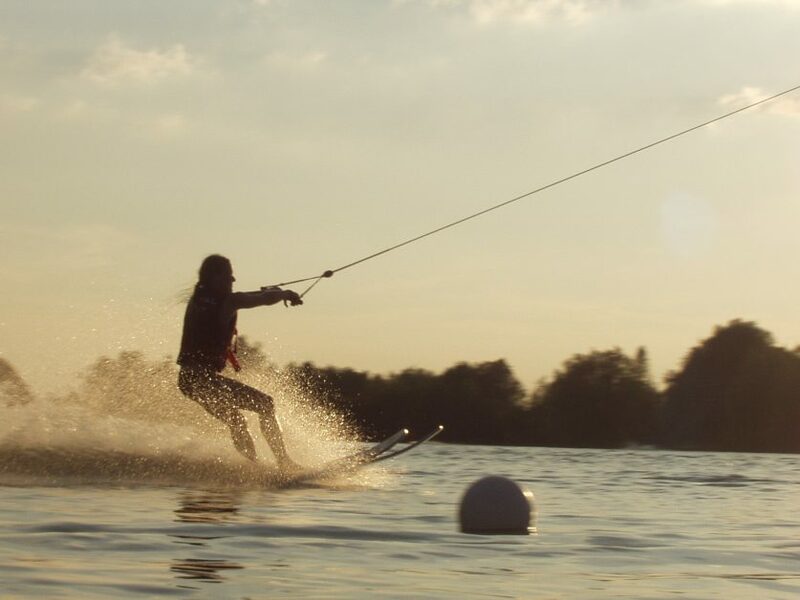 He explained that while water skiing, he went into the wake of the water and felt immediate pain in his right hamstring and instantly fell into the water. The patient stated that right after the fall, he tried to bend his leg while in the water, but couldn’t bend his knee due to pain and dysfunction from the injury. The patient had a similar injury to the same hamstring a few years ago and received Active Release Technique (A.R.T.) treatment for the injury from a chiropractor in Georgia. When we first examined him, the patient rated the intensity of his pain as an 8/10 on a scale of 0-10, with 0 being no pain and 10 being extreme pain. The pain was described as sharp, especially with movement. Things that seemed to alleviate the pain included not moving that leg, rest, ice, and compression. Aggravating factors included movement, sleeping, sitting, and driving. The patient denied any symptoms of radiculitis or compression neuropathy, including radiation of pain, numbness, burning, or tingling. Tenderness was present at the superior musculotendinous junction of the right hamstring with palpable edema, prominent/widespread bruising, and palpable adhesions throughout the length of the right hamstring. Neurological examination revealed normal lower extremity deep tendon reflexes and normal sensory examination. The patient’s right hamstring strength was determined to be 15% of full strength compared to the left. Left hamstring tightness was assessed as a baseline to compare the right hamstring. Left hamstring range of motion was 90 degrees while passively bringing the patient’s straight leg up toward his torso while he was lying on his back. Right hamstring tightness was greatly reduced with the patient’s leg reaching 45 degrees. Circumferential measurements of the mid-thigh bilaterally revealed a left thigh measurement of 58cm and right thigh measurement of 62cm. An increased circumference on the right indicates significant swelling and edema due to injury. Active range of motion was severely decreased in hip extension and absent for knee flexion. All other active ranges of motion were mildly decreased due to tightness and pain associated with movement. Passive ranges of motion were within normal limits for the hip and knee. It was determined that the patient had suffered a grade III hamstring strain/tear. This was determined due to the physical examination findings not indicating a complete tear or rupture, but significant findings indicating that a severe or grade III injury had occurred in which a large portion of the muscular fibers were torn. The patient was given an excellent prognosis for recovery in 10-12 visits, with complete restoration of functional biomechanics and absence of pain following treatment. Fig. 2. Image of the patient’s right hamstring upon presentation for follow-up treatment, 5 days post-injury. Whole Body Cryotherapy (WBC) for 2.5 minutes at -200 degrees Fahrenheit to decrease pain and inflammation and speed up recovery time. Instrument Assisted Soft Tissue Mobilization (IASTM) was performed to assist with the same treatment goals as A.R.T. Fig. 3. Image of the patient’s right hamstring following his second treatment, 5 days post-injury. 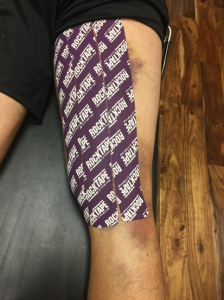 This image shows the kinesiology tape application that was utilized in three strips along the length of the injured hamstring at every visit. kinesiology tape is to reduce swelling/edema, assist the muscle during contraction/movement, reduce pain, and assist in overall healing of the injured muscle. Advanced stretching protocols (PIR) were utilized to assist in light stretching of the injured tissue to treat and prevent tightness in the injured muscle. At-home stretching and icing instructions were given to help the patient manage pain and assist in initial healing of the injured tissue. Patient was instructed that he would be seen 2x/week for first 4 weeks, followed by 1x/week for 4 weeks. Re-examination to be performed following 8 weeks of treatment. Fig. 4. Image of the patient’s right hamstring upon presentation for follow-up treatment, 9 days post-injury. Fig. 5. Image of the patient’s right hamstring upon presentation for follow-up treatment, 11 days post-injury. Fig. 6. Image of the patient’s right hamstring upon presentation for follow-up treatment, 17 days post-injury. Fig. 7. Image of the patient’s right hamstring upon presentation for follow-up treatment, 19 days post-injury. Fig. 8. Image of the patient’s right hamstring upon presentation for follow-up treatment, 30 days post-injury. The above images show the visual progression in the patient’s injury. 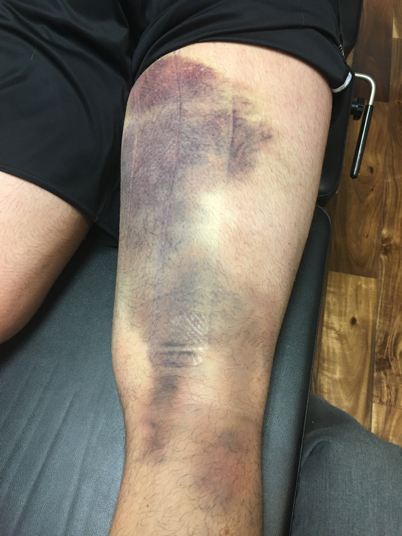 Typically, with an injury of this severity and bruising of this significance, 3-4 months of recovery can be expected for full recovery with standard treatment, and bruising can take 30-45 days to completely dissipate. As you can see, the initial bruising was much more focal and was centralized around the area of the injured tissue. 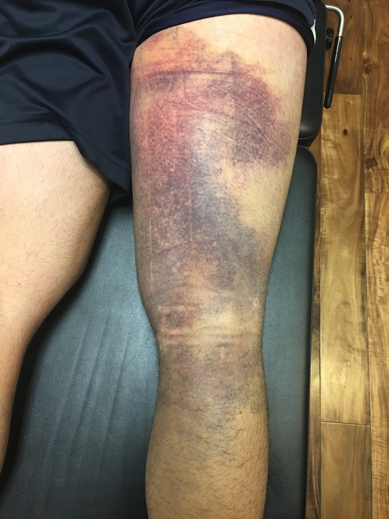 As treatment progressed, bruising began to spread in a more diffuse pattern and further down the leg. When bruising spreads down the leg in this way, it is due to the effects of gravity. This accumulation of bruising further down from the site of the injured tissue is common in moderate to severe injuries. The bruising is just blood products underneath the skin and the spreading of bruising down the leg is simply due to these blood products traveling in the skin down the leg due to the effects of gravity. At each follow-up appointment, the same treatment was administered as the treatment that was utilized at the initial appointment. The patient experienced minor pain relief with no differences in physical examination findings except for bruising beginning to spread in an outward and downward pattern. He reported that he was beginning to experience 25% reduction in pain and that walking was becoming easier. Circumferential measurement of the thigh revealed a 2cm decrease in size. Bruising continued to visually spread in an outward and downward pattern more at this appointment. Contractile strength was still greatly reduced (15%) and tightness was moderately reduced, reaching 50 degrees. Pain was still reported to be reduced by 25% and walking was continuing to improve. Bruising had now begun to dissipate and was much more diffuse with less depth of color and an overall visible reduction in the amount of bruising and swelling present. The patient reported a 50% reduction in pain with no difficulties walking. 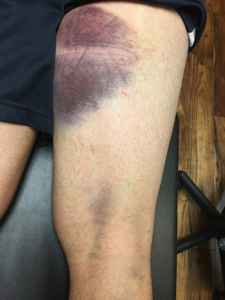 Bruising had now reduced by approximately 80%, with very little present in the thigh where the initial injury occurred and minor residual bruising present in the superior calf due to gravity. Circumferential measurement of the thigh revealed another 2cm reduction with the left and right thighs now measuring the same circumference. Contractile strength had now increased to approximately 30%. The patient was able to fully contract his hamstring with no resistance, flexing at the knee and bringing the foot all the way to the buttocks while lying on his stomach. Tightness was greatly reduced with the leg now reaching 70 degrees. The patient reported a 60% reduction in pain with no difficulties walking or performing other activities of daily living. Bruising had now reduced by approximately 95%, with no bruising present in the thigh and very minor residual bruising present in the superior calf due to gravity. Contractile strength continued to increase to approximately 50%. The patient was able to fully contract his hamstring against light resistance. Tightness was the same as the previous appointment. Patient was out of town traveling for work since his last appointment, therefore, he was unable to be seen for 11 days. The patient reported an 80% reduction in pain with no difficulties performing basic activities. He reported that he had gone for a light jog and that his hamstring felt tight but was not painful. Bruising was now 100% cleared and absent. Contractile strength continued to increase to approximately 75%. The patient was able to fully contract his hamstring against moderate resistance. Tightness was reduced with the leg now reaching 80 degrees. 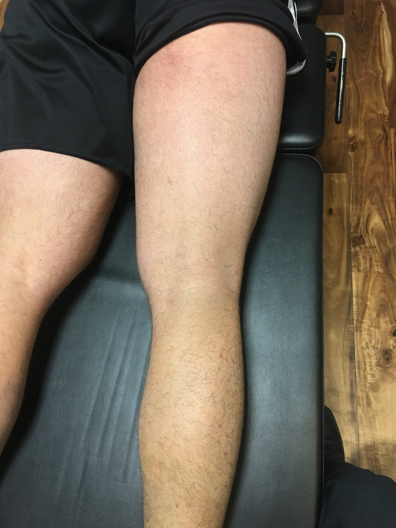 The patient reported no pain in his right hamstring with no difficulties performing activities of daily living. The patient began to weight lift again, performing squats and lunges with light-to-moderate resistance. A step-wise progression in weight lifting was instructed and incorporated, including beginning light single-leg hamstring curls. The patient’s only activity restriction was that he was instructed to not perform deadlifts at this time. Contractile strength continued to increase to approximately 85% of full strength. The patient was able to fully contract his hamstring against heavy applied resistance from the doctor. Tightness remained the same as the previous appointment. The patient continued to report no pain and no difficulty performing activities of daily living. He reported that he was able to lift weights with his legs twice since his last appointment and that he was able to continuously increase the resistance each time. The patient stated that his squat and single-leg hamstring curl were now only slightly below his pre-injury ability. The patient was instructed that he may begin to perform deadlifts at a very light weight. Contractile strength continued to increase to approximately 95% of full strength. Tightness improved to normal levels with the patient’s injured leg now reaching 90 degrees, similar to his uninjured leg. Now let’s discuss briefly the patient’s response to treatment and progression following treatment. Following the patient’s ninth treatment he was released to as-needed care since he had reached greater than 90% improvement. The only remaining factor to address following that final visit was the mildly decreased strength against heavy resistance while weight lifting. The patient was given specific instructions as to how to progress with his strength training going forward. Utilizing the 5280 Cryo & Recovery Clinic advanced treatment protocols, the patient was able to achieve full recovery in 50% of the time than would be expected with other providers. 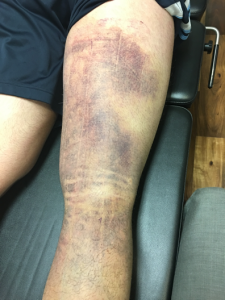 As you can see, the patient’s bruising was hardly visible by his seventh appointment (19 days post-injury), which is also a 50% reduction in the expected time from standard treatment. We are able to achieve this by focusing on manual treatment of the muscle with A.R.T. as well as utilizing whole body cryotherapy and advanced stretching protocols. The majority of other “standard” treatments focus on rest, ice, electric stimulation, stretching, and NSAIDs. These treatments are aimed at managing pain and reducing swelling while allowing the injured tissue to heal itself. The problem with not addressing the injured tissue with manual treatment is that when the body heals an injured muscle it tends to do a poor job. Our bodies lay down fibrotic (scar) tissue, which acts like glue in the injured muscle. This can be problematic for long-term recovery and elevated risk of reoccurrence of injury because muscle is a contractile tissue and cannot function properly with fibrotic tissue present. If left untreated, the healed tissue tends to be tighter and exhibits decreased strength. By utilizing the 5280 Cryo & Recovery Clinic protocols we are able to strip out the fibrotic tissue and restore functioning to the injured muscle. Additionally, Whole Body Cryotherapy is much more efficient at reducing pain, inflammation, and swelling compared to NSAIDs and ice. By utilizing the treatment protocols previously described, we are able to greatly reduce recovery time, injury reoccurrence rates, and properly restore strength and overall functioning to the injured muscle. Whether you have a chronic or acute muscle injury, the doctors at 5280 Cryo & Recovery Clinics should be your go-to team for assessment and treatment of the injury!